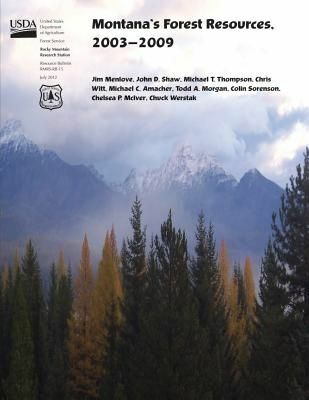 This report presents a summary of the most recent inventory information for Montana's forest lands. The report includes descriptive highlights and tables of area, number of trees, biomass, volume, growth, mortality, and removals. Most of the tables are organized by forest type group, species group, diameter class, or owner group. The report also describes inventory design, inventory terminology, and data reliability. Results show that Montana's forest land totals 25.6 million acres. Sixty percent (15.4 million acres) of this forest land is administered by the USDA Forest Service. Douglas-fir forests cover 7.5 million acres or roughly 29 percent of Montana's forested lands, making it the most abundant forest type in the State. The lodgepole pine type is the second-most common individual forest type comprising 17 percent of Montana's forest land. Lodgepole pine is the most abundant tree species in Montana by number of trees, and Douglas-fir is the most abundant species by volume or biomass. Net annual growth of all live trees 5.0 inches diameter and greater on Montana forest land totaled 289.8 million cubic feet. Average annual mortality totaled nearly 746.3 million cubic feet.